Coming soon to the Sunshine State: the sunshine city. 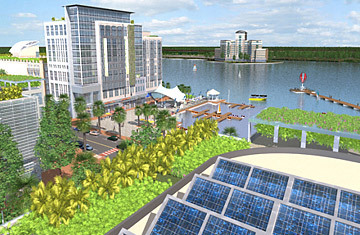 To anyone familiar with southern Florida's planning-nightmare sprawl of golf courses, strip malls and cookie-cutter subdivisions named after the plants and animals they replaced, Kitson's vision for his solar-powered, smart-growth, live-where-you-work city of 45,000 people east of Fort Myers is breathtakingly different. That's why the press conference held today to reveal his development plans for the historic Babcock Ranch property will feature representatives from the Audubon Society, the World Wildlife Fund and the Sierra Club. The history of Florida is littered with spectacular landscape-changing proposals that never made it past the drawing board. The watery wisp of Everglades National Park known as Flamingo  population zero  was once touted as the next Chicago. Kitson's financial partner, Morgan Stanley, has had a rough time lately, and some locals remain skeptical that he can turn his $2 billion green vision into reality. "We've been hearing a lot of very exciting ideas, but we have no idea how this is actually going to happen," says Conservancy of Southwest Florida CEO Andrew McElwaine. Then again, Kitson has already cleared two of his most difficult hurdles: getting the land and the right to build on it. In 2006 he engineered a deal with then governor Jeb Bush and the previous owners of the 91,000-acre ranch in which the state spent $350 million to purchase 73,000 of the most environmentally sensitive acres  it was the largest preservation buy in Florida history. Kitson paid about the same amount for the remaining 18,000 acres, and he says half of that will remain green space within the new community. Kitson has been promising unprecedented sustainability all along, but today's shocker was the announcement of Florida Power & Light's plan to provide electricity for Babcock Ranch with a 75-megawatt photovoltaic plant nearly twice as big as the current record holder in Germany. Solar power has been slow to catch on in the gas-powered Sunshine State, but FPL hopes to start construction on the 400-acre, $300 million plant by year's end. The utility expects it will provide enough power for Babcock Ranch and beyond. At $4 million per megawatt  FPL estimates the cost to its customers at about 31cents per month over the life of the project  it should be more than four times as cost-effective as the nuclear reactors FPL is trying to build near the Florida Keys. Kitson's slick website also promises "groundbreaking" strategies to promote energy efficiency for all Babcock Ranch buildings. And that's not all: "Ultramodern electric vehicles will glide along avenues beneath the glow of solar-powered street lamps, plugging in to recharge at convenient community-wide recharging stations. Revolutionary smart-grid technologies will monitor and manage energy use, while smart-home technology will allow residents to operate their homes at maximum efficiency." Kitson's goal is to reduce carbon emissions, oil dependence and energy bills, while turning Babcock Ranch into a mecca for clean-energy research and development, attracting high-tech companies that will provide high-wage jobs. The idea is to create a self-contained community where people can live and shop and work and go to school and have fun without long car trips. Kitson's construction plans start with a walkable and bikeable downtown that will include a magnet school, a wellness facility and sustainable retail, as well as 8,000 homes  including affordable homes for local workers. "In Florida, everyone has to drive everywhere they want to go," Kitson says. "And everyone thinks the solution to congestion is to build more roads. I think the solution is to design communities so you don't need more cars on the roads." Of course, talk is cheap. It's no secret that growth has been Florida's primary economic engine for decades. Yet Fortune 500 companies haven't flocked to its sprawling bedroom communities with lousy schools and overpriced houses, and the paving of paradise has left the state with overtapped aquifers, overcrowded hospitals, overstretched services, traffic jams, a dying Everglades and a vanishing sense of place. Kitson promises to avoid the mistakes of the past. "We're impressed with their commitments," says Wayne Daltry, Lee County's director of smart growth. "Now we have to pound them to keep their commitments. No plan survives contact with reality  and in this case, the reality is called the bottom line." Given the dismal state of the economy in Florida and the dismal environmental track record of developers, it's easy to be skeptical. Kitson already had to lay off some of his southwest Florida staff. But unless the sun stops shining, the current housing collapse won't last forever. Florida is always going to be nicer than Brooklyn or Cleveland in the winter. It's about time someone tried to make growth environmentally and economically sustainable. And it's about time someone tried to use that sunshine for something other than getting a tan. Cast your votes for the TIME 100.